I’ve always looked at serious bike-packers similarly how I look at bungee-jumpers: I admire them, but I would NEVER do it myself. How they crawl mile for mile, even in flats, loaded with dozens of bags…it doesn’t look like bicycling to me. On the other hand I was always frustrated by the limited reach of one-day tours…after 50-70km you have to think about turning around to still make it home. That puts many attractive regions and locations out of reach! Then I saw the Youtube video of this gal, Tori, who did some bike packing in Thailand. No, I’m not including her video because she’s cute…I really learned something from her! Shame on you if your mind was in the gutter! This was something I could imagine myself doing! 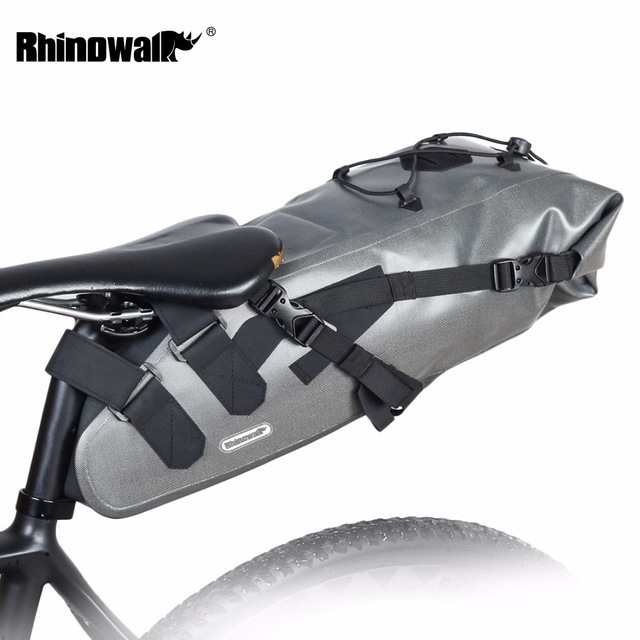 So I ordered a 10 l bag that can be attached to a road bike…road bikes are for purists and don’t have racks. Voilà – ready for multi-day tours! 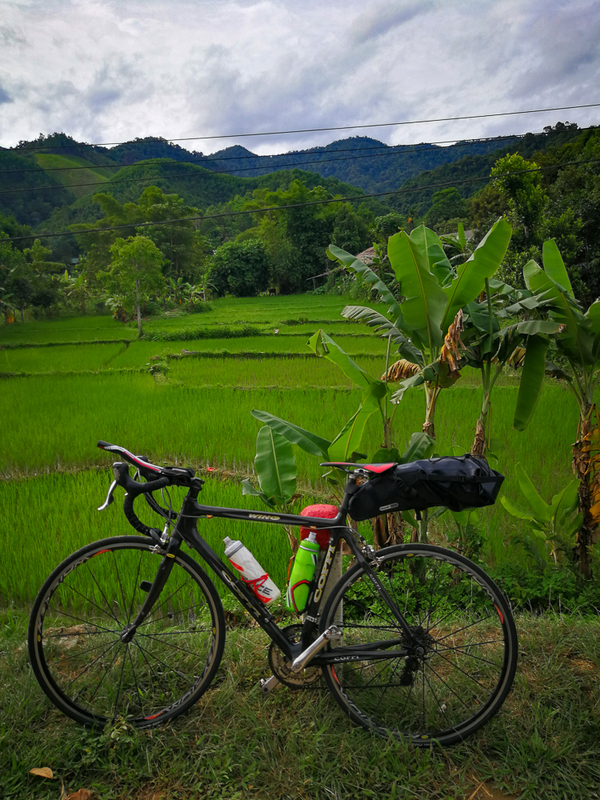 One of my favorite routes heading out of Đà Nẵng is QL14G. 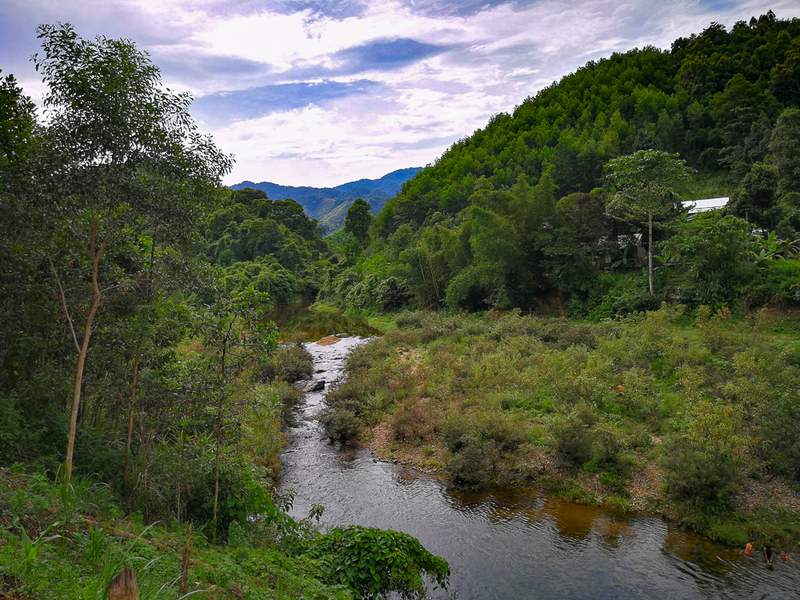 It meanders along a river through a valley between Bà Nà Hills and the neighboring mountain range, sweeping uphill until it eventually enters a village called Prao. 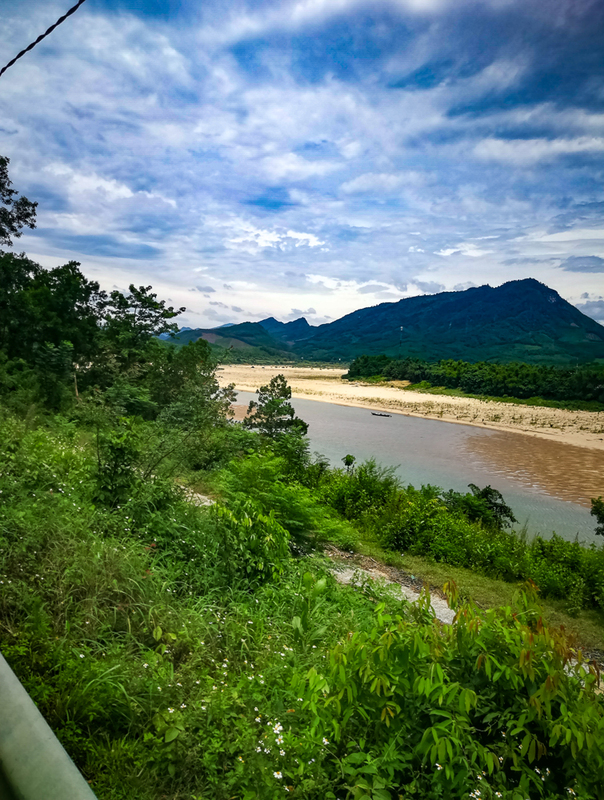 Prao is about 80-some km from Đà Nẵng, which puts it just out of reach for a day tour, especially if you prefer a loop and don’t want to go back the same way you came. 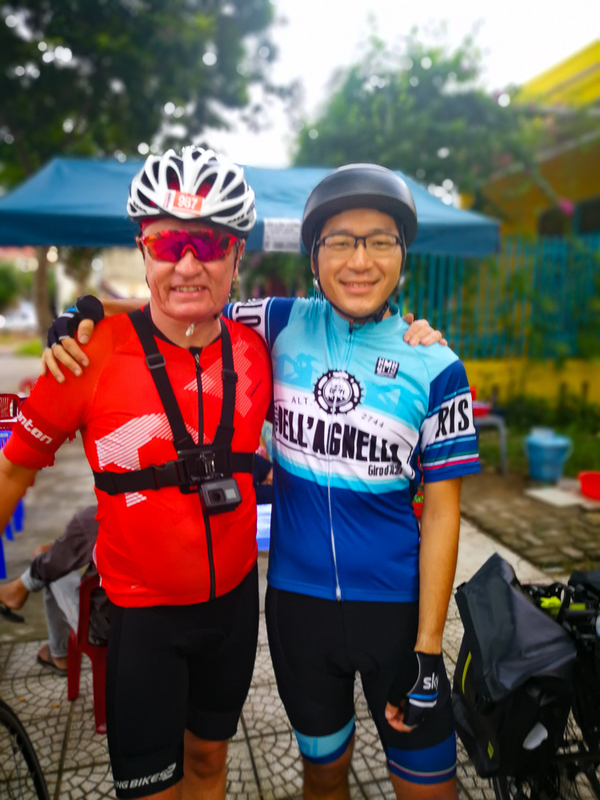 With the one-day limitation removed, my bicycling buddy Justin and I decided to head for Prao and then take the Ho Chi Minh Trail south, loop around the mountains south of Bà Nà Hills to get back to Đà Nẵng. Prao looks somewhat interesting on the map, making a good candidate for staying overnight. 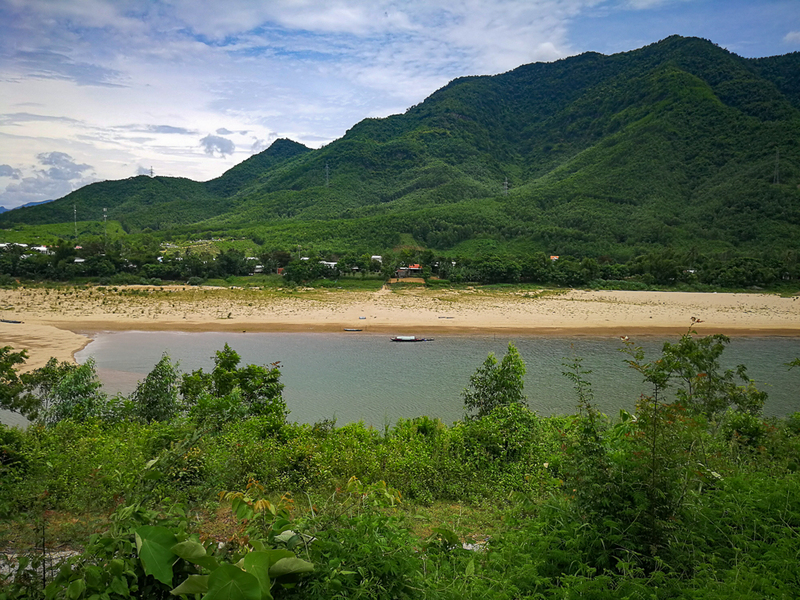 Since the 80-some km to Prao seemed a bit short for one day, we started the tour with a little detour along the northern beach of Đà Nẵng and to the valley cable car station of Bà Nà Hills. 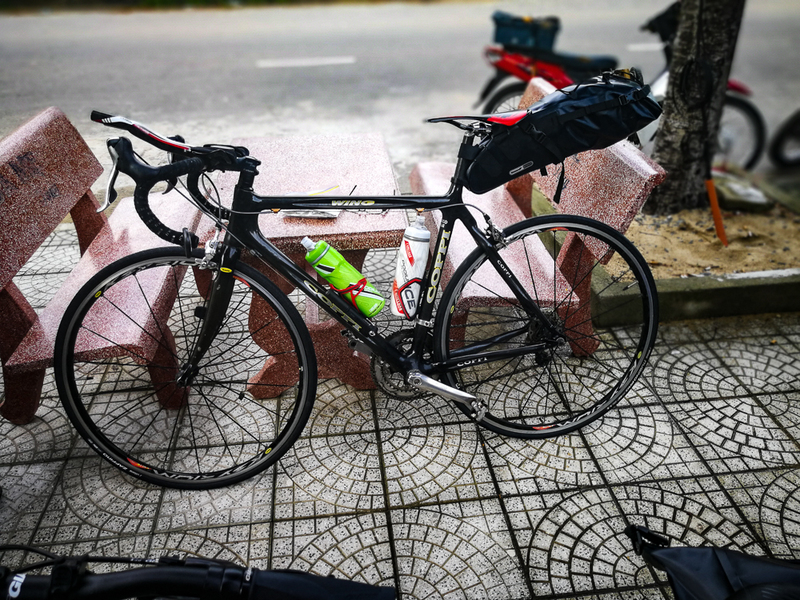 That put us at a little bit less embarrassing 105 km for the first day and it saved us having to go through downtown Đà Nẵng. On the maps above, make sure you select “Terrain” instead of “RWGPS” to see the mountains. These maps are interactive…play a little bit with them! Example: You can follow the elevation profile at the bottom and see where on the route this mountain appears! Thinking about our ride, I’ve always expected my bag to be half empty…my bag can hold 10 l, and it’s only a two-days ride! Once I ended up packing my bag on the day of the ride I realized how small of a volume 10 l is! I filled it up to the rim, and I was definitely not packing lavishly! Then came the next difficulty: While I had tried to mount the bag to the bike while still empty, I never had tried to mount the loaded bag… I’m supposed to meet Justin at the agreed meeting point in 10min and I’m struggling to attach the bag to the bike! I asked Justin to come to my apartment instead, in the meantime I brought up pictures with this bag on the Internet to figure out how exactly to attach it to a minimalist road bike saddle…and I finally figured it out! So after the bag drama and after the mandatory photo session we were finally on our way! Justin (right) and me. I’m trying to talk him out of this helmet…not successful so far! He’s the nicest biking companion you can wish for, though! 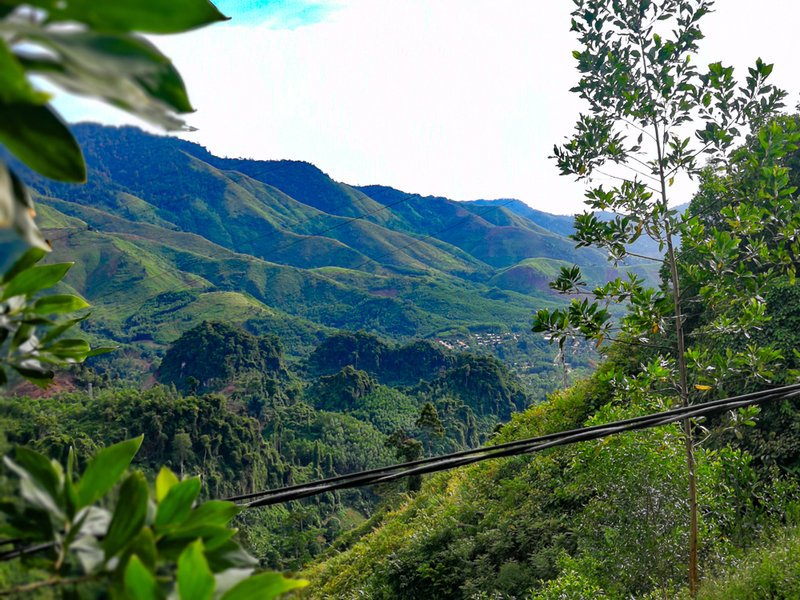 After the agreed detour along the northern shore of Đà Nẵng and to the valley station of the cable car going up to Bà Nà Hills, we were climbing, past the Hot Springs and towards Prao. The video below shows the highlights of the first day: It starts with going over the iconic Thuận Phước Bridge, and after that it’s all lush and green. The batteries of the GroPro camera I had rented ran out of juice before we descended into Prao. The footage you see is the road QL14G leading into the hills around Bà Nà Hills. Make sure you watch these videos with sound…the music is quite nice (I think)! Arriving in Prao, Justin steered us towards the guest house he had found online. 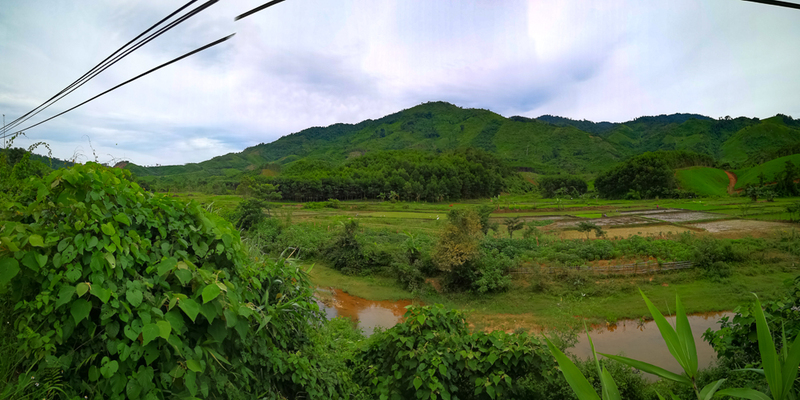 Rooms were around 200,000 VND each and we decided to book two rooms….some privacy after a long day is in the saddle seemed worth the extra money. The lady who owns the hostel had asked us whether we’d like to have dinner in the hostel and we had been a bit undecided about that, not clearly saying no. Well, she decided it for us and when we came downstairs, nice smells were in the air and stirred fried rice was waiting for us. Not being a big fan of hostel/hotel food, I had actually been looking forward to eating somewhere in the village, but I knew that we couldn’t say no now. The food ended up being delicious! We chatted a while with other foreigners staying in the hostel, mostly motor-bicyclists. Exchanging stories and recommendations with other travelers can be so much fun! I started to get a bit antsy, though, keen on exploring the “night life” of Prao. 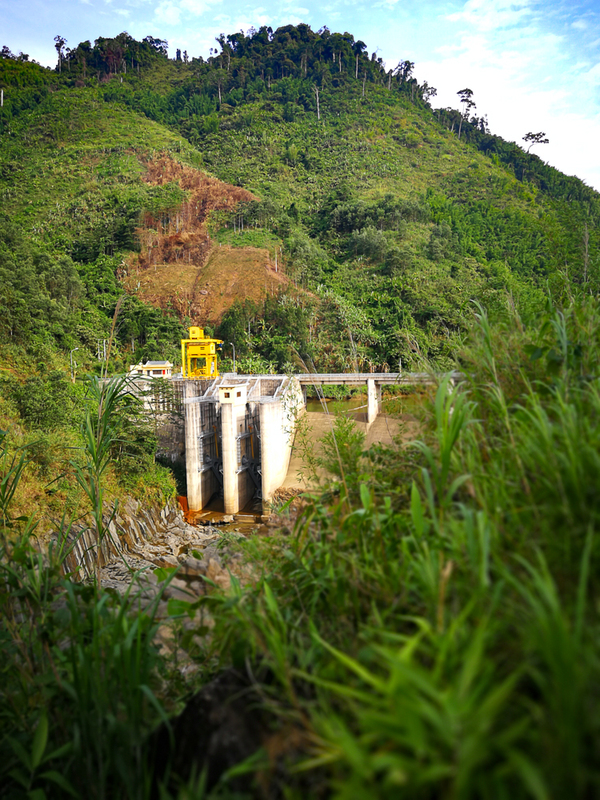 Justin and I ventured out and walked what we believed were the major roads of Prao….nothing! Not a bar, not even simple restaurants! Every village in the world has their local watering hole…not Prao. Only lots of dogs and kids, who (the kids, not the dogs) were yelling their usual “Hello! What’s your name?” at us. Now I was glad that we had eaten at the guest house! We didn’t even see any adults! Prao seemed like a village where the kids had killed all the adults! That would be the material for a nice horror flick! Disappointed, Justin and I finally returned to the guest house and took some beers out of the fridge. Even though we got up at 5:00 AM next morning, the lady of the guest house got up with us and made us a decent breakfast. I was my usual slow self in the morning, until even Justin got impatient and made a comment that we should REALLY get going now. So we did! These dams can be found throughout the entire valley. At the end of this long descent I stopped to get fresh water, and as I paid Justin rode by, listening to music and not hearing our yelling! I sent him an SMS, but he seemed to be completely in the zone. I rested for a couple of minutes and got back on the bike. Eventually, we started communicating again and met at a simple coffee place. We also found lunch close by. 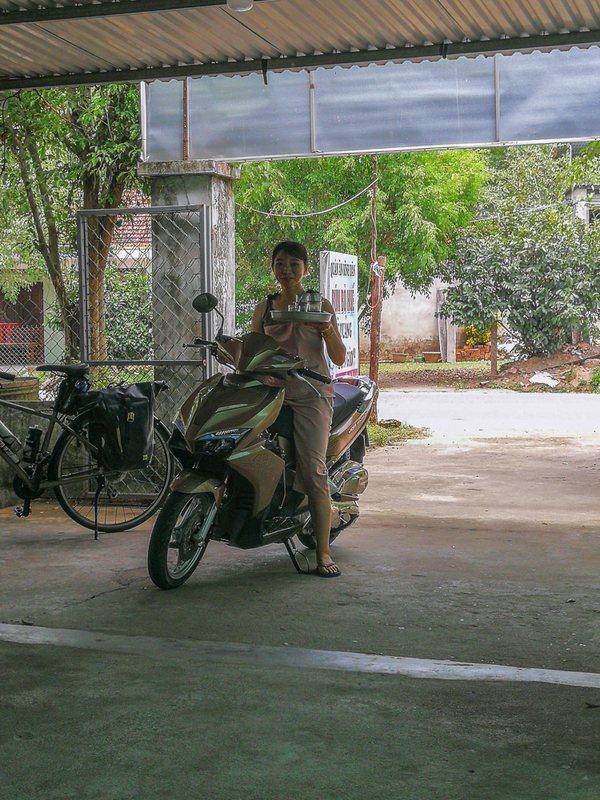 The lady serving us lunch had the bizarre habit of always jumping on her motorbike to get whatever we ordered. We ordered noodles…she jumped on the bike. We ordered Coke with ice…she jumped on the bike. Finally, we ordered coffee, and, yes, you guessed it…she re-appeared, balancing two coffee cups on a tray. She did all this with a demeanor that was completely nonchalant….as if this was the most normal thing for her! I didn’t dare to order ice for my water bottles, fearing she would jump on that motorbike again. Finally, after a long and blissful descent, we crossed another river and turned left on QL14B. The road flattened out and we were able to admire the mountains we went through yesterday from the other side. As we pass these mountains and turn north-east, the road gets more and more busy. Lots of heavy trucks hauling crushed rock from the local quarries….this morning we were in bicyclist’s heaven, now we’re seeing the other end of the spectrum. 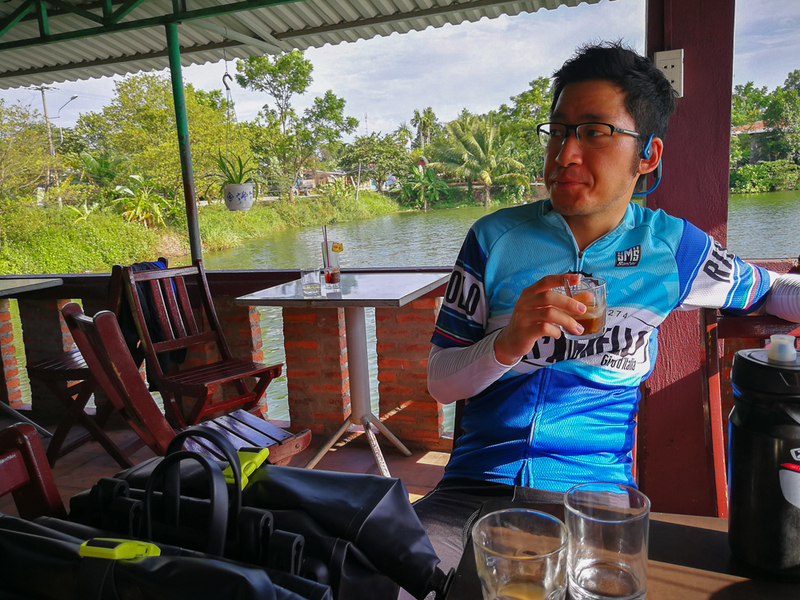 Justin and I stop one last time at a coffee place on a little pond before we enter Đà Nẵng. What a welcome oasis from all the heavy traffic!